The Philips SHL5000/00 delivers outstanding music, no matter what the beat. 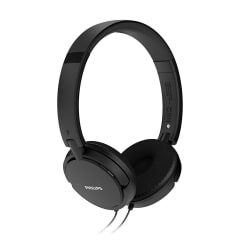 The neodymium dynamic drivers help achieve crisp sounds. Better drivers are essential for better sounds and Philips delivers nothing but perfection. In addition, the Mylar dome diaphragm ensures that you have amazing sound quality even when you turn up the volume. Let nothing come in the way of your music. These headband earphones are easy to stash away when you aren’t listening to music. Fold them to a flat and carry them around without any hassle. The Philips SHL5000/00 is meant for commute and convenience. 32mm speaker drivers give you great sound with a deep bass. Listening to every detail in the music you love is what makes the experience all the more rewarding. The right blend of depth without the jarring after sound. Music is naturally soothing, add to the equation complete isolation from the world outside. The soft cushions offer comfort and smartly block noise from the outside. These headphones are meant for the outdoor, quiet solitude can now be enjoyed by plugging the 1.2m cable ideal to length to give you the freedom to put your audio device wherever you want. Don t fret about hurting your ears or head after a few tracks, these Philips headphones have soft leather ear cushions that make hours of endless music nothing but pleasurable.